Home » Dinna Mardiah » What's next? 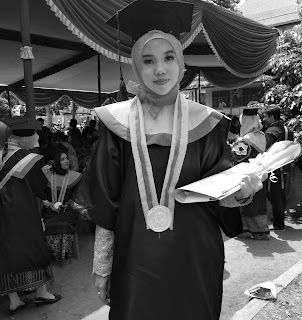 I'm officially a graduate on August 24th, i graduated from Sriwijaya University with Food Technology class, which blows my mind when I think back to Sixth From where I was genuinely considering turning down my place. I didn't think I'd be able to keep up with the pressure and the work load that studying there would entail and so I very nearly didn't go. My academic life has taught me that we are very rarely good judges of our own ability. I've always had super low confidence in my own potential and I think that comes with always wanting to be a high achiever. Before the period of graduation is even over, the first question from everyone's lips is 'So, what's next?' And my response is perfected down to a T ‘Oh, well, I like writing so probably something journalism related…but, I’m not really sure yet… I don’t have a big, set in stone plan'. Depending on the audience, the reaction is a mix of interested nods and further questioning, poorly disguised judgement, or even hints of jealously. The first group, mostly family and close friends, or those not in the directly related academic sphere, are genuine and engaged with my vaguely focused (emphasis on vague) future plans. They find the prospect of journalism interesting, and take down the name of my website to have scroll through when they're home. They wish me well and they mean it. And the last group, often people my age who have also just graduated, slipping straighr from grad-gowns into office attire and joining the rest of Newspaper daily commuters into jobs in tall shiny buildings in the city. This is the most interesting group to me, and I don't intend to sound patronising when I write this. But they very rarely sound enthusiastic when they detail to me the companies they're joining, the 15+ hour days they'll be putting in, and the future career options it will give them. I find it mind-boggling. The last 6 months of university consisted of daily chit-chat regarding intership prospects and graduate schemes. In all honestly, I had to work so hard to get through exams that if I had been multitasking and looking for grad-schemes at the same time, I probably would have self-combusted. So maybe it's just my weaknesses that have me set on a different path on the majority of those who I graduates with on August 24th. Whilst it's hard not to think I'm potentially wasting time or missing out on jam-packing my (non-existent) CV with amazing interships, it's important to remember that it's normal and very much O.K to be where we are in our lives, especially at this age. I know people in their 40s who still haven't figured out where they want to be and what they want to do. Wherever you are in life, or wherever you're up to, it's fine as long as you're happy and able to get by. No amount of money, or promise of money, is worth sacrificing your happiness for. At the moment I can't help but feel like I'm floating through life and need a kick up the backside, but if I had gone against my gut feeling, I'd have been drowing. My one piece of advice for other students reading this would be: don't jump head first into the first intership or grad-scheme you can find (be that during university or after) out of fear and pressure. If you want to focus purely on your degree or need some wind-down time after you graduate, it's O.K. I'ts normal and healthy and you're not failing, you're not lazy, and you're not less successful than anyoune else. Stay focused, but stay sane.